ONTRAPORT can send email and SMS messages based on specific dates, such "10 days before a birthday" or "3 days after opt-in". 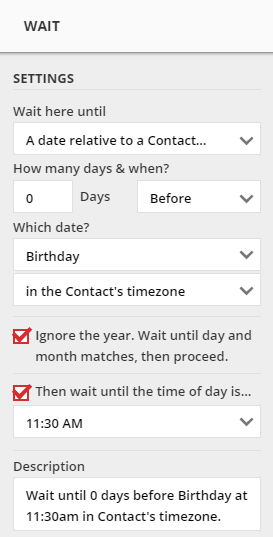 This allows you to customize your interaction with your Contacts based on any date. For US addresses Postcards can also be sent based on specific dates. This article will use a birthday greeting campaign as an example. Note: Postcards are mailed to US-based addresses only, and the option to create Postcards is disabled in non-US based accounts. If you have a non-US based account, but would like to mail postcards to US-based addresses please contact Support to have the option enabled. 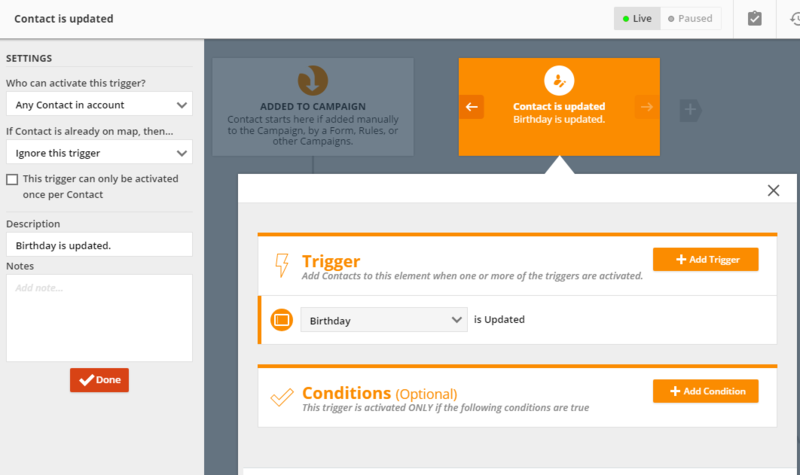 You can add all Contacts to a Campaign even if some of them have an empty Birthday date field. The Campaign will simply ignore the Contacts that don't have the field completed, and automatically activate for them when the field has a date in it. You can use a Group action to add all of your Contacts to the Campaign. 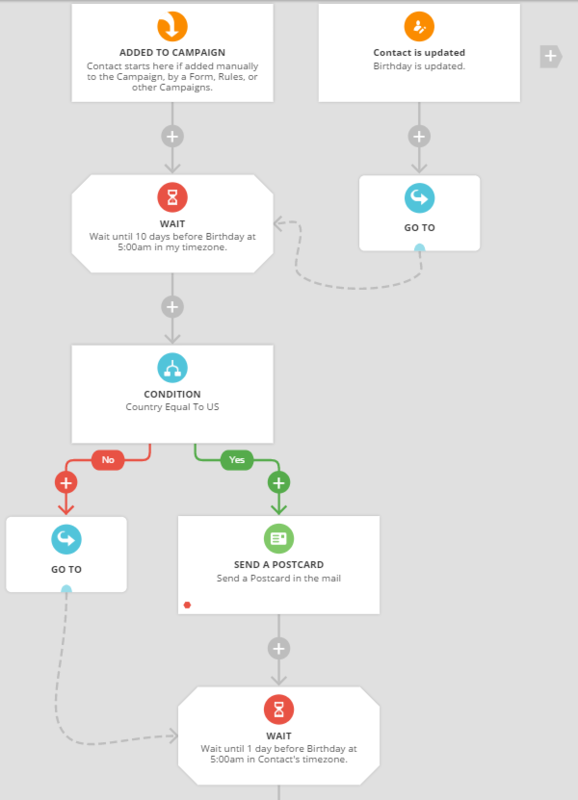 In this example we will send a Postcard ten days before their birthday if they are in the United States, an email the day before their birthday, and an SMS at noon on their birthday. We will use three Wait elements for the timing of our birthday greetings. This Campaign will also use a Condition element to make sure the Contact can receive a Postcard, and Goto elements to make this Campaign "evergreen" and work continuously year after year. Postcards are only available for addresses in the United States. Add a Condition element below the Wait element to test for the country. 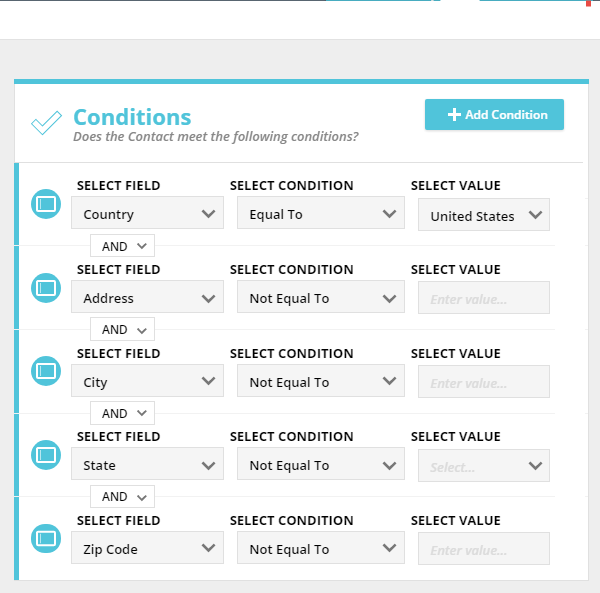 We select the Condition "Field is value" from the drop down, select the Country field and select the condition Equal To the United States. Then, we add several more conditions to make sure the Address, City, State and Zip Code fields have some data. We use the logic Not Equal To and leave the value blank. This ensures only Contacts with the Country field filled with United States, and some data in the Address, City, State and Zip fields will be directed to the Send a Postcard element. On the Yes branch of the Condition we add the Send a Postcard element from the Actions menu. We will configure the Send a Postcard element later. 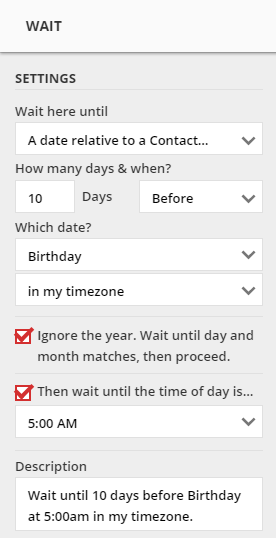 Add another Wait element after the Send a Postcard element and configure it to wait for A date relative to a Contat's date field arrives and select the Birthday field again. 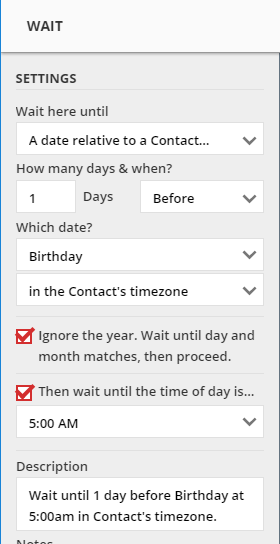 We set the rest of the settings to wait until 1 day before the Birthday in the Contact's timezone, ignore the year, then wait until it is 5:00 AM. Below the Wait element add a Send an SMS element and configure it with the text message you want to send the Contact at 11:30 AM on their birthday.